Prama has been part of the Ulta Beauty family since 2014 and is Senior Vice President, Digital & eCommerce. She loves connecting digital and physical retail experiences and bringing them to life for our guests. Prior to Ulta Beauty, Prama led retail eCommerce teams at Toys R Us and Kenneth Cole. 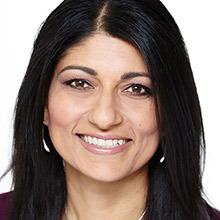 In addition to her retail industry experience, Prama was a management consultant with Booz Allen and had a tenure at Ford Motor Company where she held various roles in product strategy, design and development. From truck engines to bold lips, she’s excited to be in the beauty industry! The Ulta Beauty Digital & eCommerce team delivers great guest experiences through Ulta.com and our mobile apps – managing online merchandising, digital marketing, user experience, digital product management and operations. Prama holds a BS in Electrical Engineering from Oakland University, an MS in Electrical Engineering from Wayne State University and an MBA from the University of Michigan.